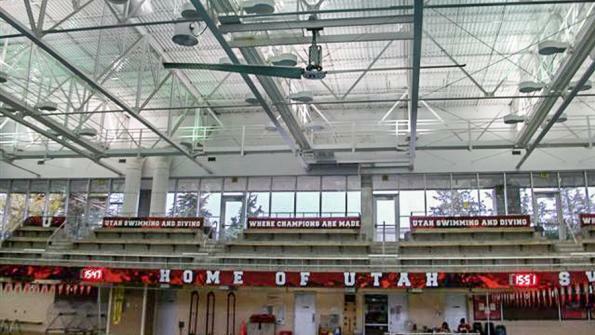 The University of Utah’s Ute Natatorium, located in Salt Lake City, is a swimming and diving venue that regularly hosts NCAA Division I competitions in its six-lane training pool, eight-lane competition pool and diving well with four diving boards. As part of renovations designed to make the building more appealing as a NCAA event site, the university’s facility managers decided to address its chlorine odor problem. While chlorine is a necessary disinfectant to protect the health of swimmers and other patrons, the chloramines created during the disinfection process can pose health risks as they build up and become airborne. Symptoms of over-exposure are irritation to eyes, nose, mouth and lungs. Assistant Director of Events and Facilities Steve Riley worked with local building consultant Alan Jarvis of Arbon Equipment Corp. to develop a plan to mitigate the issue. Building managers had previously used ceiling fans to control chlorine odors. However, the high-speed ceiling fans were loud and couldn’t run continuously, and the odors built back up when the fans were off. Riley honed in on an approach using high-volume, low-speed (HVLS) fans. The energy-saving fans are designed to move large volumes of air at low speeds. The units deliver increased air movement and can disperse concentrations of airborne fumes. The university’s College of Health noted that chloramine levels in the natatorium were “significantly lower” in readings taken after the fan installation. The fans were installed in 2010. Today, Riley remains thrilled with the decision to install the equipment. “The chlorine smell complaint is now gone,” says Riley. Click here to learn more about Rite-Hite.